If Halloween is associated with a single image, it would be the pumpkin. Just like the egg for Easter or the pine tree for Christmas, pumpkins have been a big part of Halloween for the longest time. Since the season of scares is just around the corner, numerous events and activities are already lined up like office parties, trick or treat activities, and Halloween themed birthdays or wedding celebrations, to name a few. Pumpkins are the most popular images associated with Halloween and they can be found on every design. Listed below are some of the Halloween templates you can use for any event. 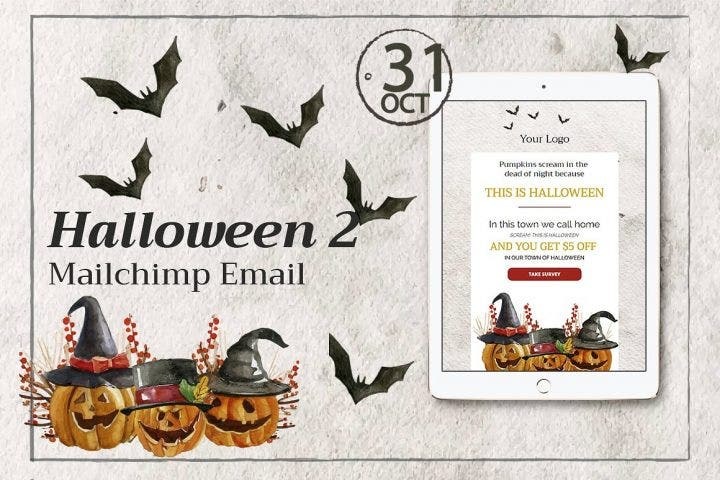 If you are sending an email blast for a Halloween party invitation or offering a Halloween discount in your store, use this email template with images of pumpkins and bats. The images are created using a sketch effect and resemble designs used in a children’s book. Despite the template having a simple white background, images of flying bats make up for the lack of a background color. Since the text (mostly event details) are more important in an email template, a minimalist design like this one where the images are compressed to have a small size and a simple background color is preferable. Get those pumpkins and knives ready and host a pumpkin-carving party this Halloween perfect for both kids and adults. Pumpkin-carving parties are a unique way to celebrate Halloween and deviate from the common trick-or-treat and dress up parties. Don’t worry as the text is fully editable and you can use this party invitation card template for your own Halloween-inspired party. This party card template comes in 5″ x 7″ (portrait) or 7″ x 5″ (landscape) sizes with two printing options available (standard and high definition). Aside from the 12 paper styles and colors, you can add eight more sizes and six shape styles using the “Customize it!” button. This template also has a high-quality, full-color, and full-bleed printing on both sides. Standard white envelope templates are also included. 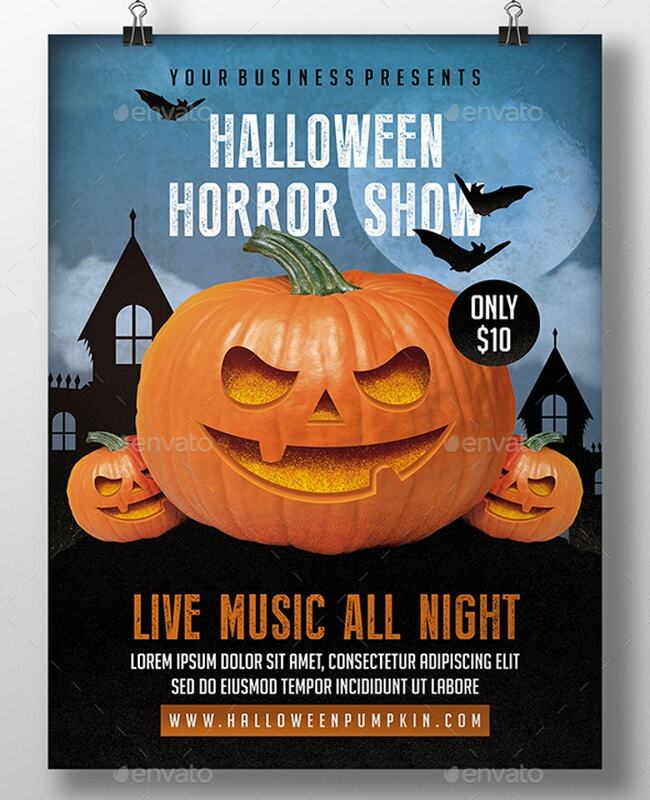 Here is another Halloween email template which you can use for your business needs. Pumpkins with jack-o-lantern carvings don’t need to be applied to all Halloween designs. Sometimes a photo of a real pumpkin is all it needs to signify that Halloween is indeed here. This pumpkin email template uses a high-resolution photo of a group of large and beautiful pumpkins. The text is again given emphasis as it is placed in a text box having a low opacity effect. A bat image is also incorporated in the text box for an added Halloween inspired layer. 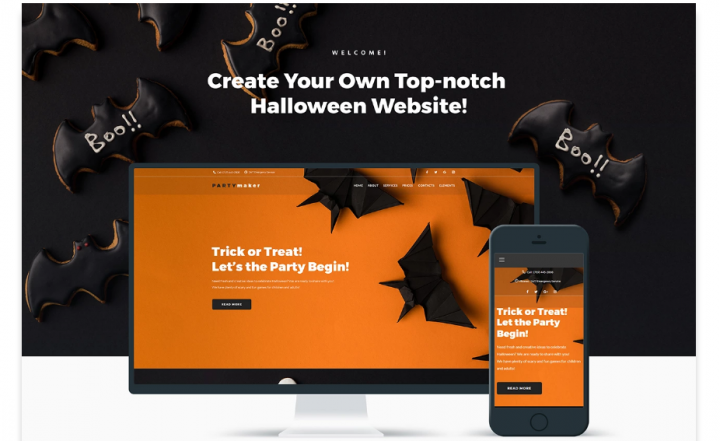 This Template is one of the best Halloween-inspired templates you can use for your website. The glowing jack-o-lantern pumpkin is beautifully designed and perfectly complements the grass silhouette patterns and dark blue background. Similar to the previous template, use this one for any type of website. This template is the perfect template to use if you use Flash on your website. Flash assists users for easy website editing and SEO compatibility. Animation for this template is completely Flash and has a width of 1400px. Hosting requirements meanwhile are PHP 5.4.04 or 5.5.09+ or 5.6+, and Zend Guard Loader. This template is available in Adobe Photoshop. 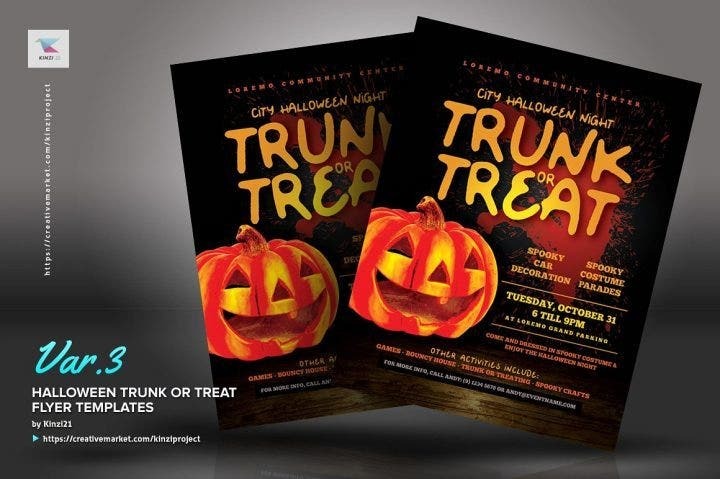 Use this glowing pumpkin flyer template for your Halloween event. 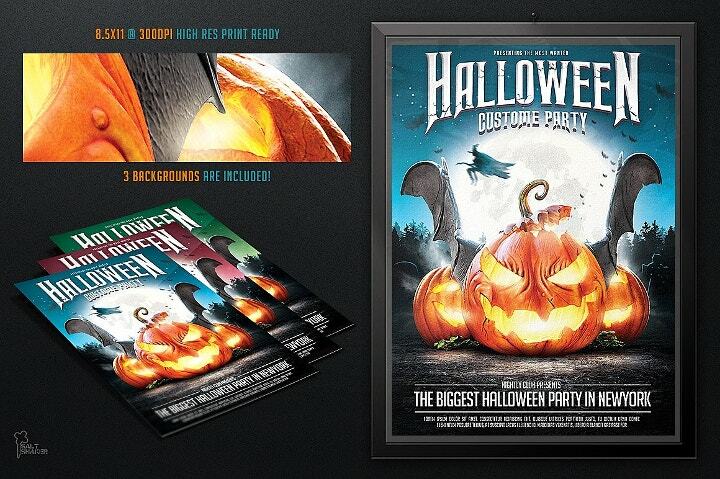 The template’s sample design is an invitation for a Halloween-themed car show and party. If you are hosting any auto event in the upcoming horror season, try this beautifully designed flyer template and hand it out to your guests and other people you want to invite for the event. Aside from the pumpkin, a splattered blood effect is also incorporated in the background. Children easily get frightened by urban legends and famous horror icons like Dracula and Frankenstein’s monster. Usually, these characters are introduced to children in movies or bedtime stories being read by their parents. To make these characters more child-friendly, their appearance needs to be changed as seen in this birthday invitation template. Colors need to be lighter and certain features like blood and disfigured body parts need to be removed or adjusted. 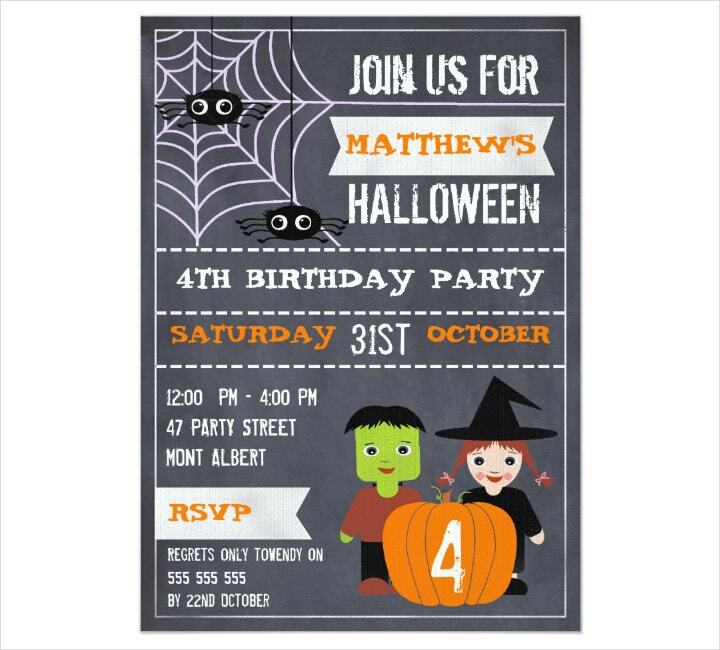 In this kids’ Halloween chalkboard birthday invitation template, images of Frankenstein and a witch are given a makeover and now look more like dolls rather than terrifying creatures that want to tear you in half. Cute images of spiders with big bulging eyes and a chalkboard design occupy the background. Similar to the template above, this template (5″ x 7″ for portrait or 7″ x 5″ for landscape) has 12 unique paper types and colors and you can additional sizes and shape styles through the “Customize it!” button. Two printing options are available: standard and high definition. White envelopes are also included in this template when an order is made. Trick-or-treat and dress up parties are not the only activities during Halloween. 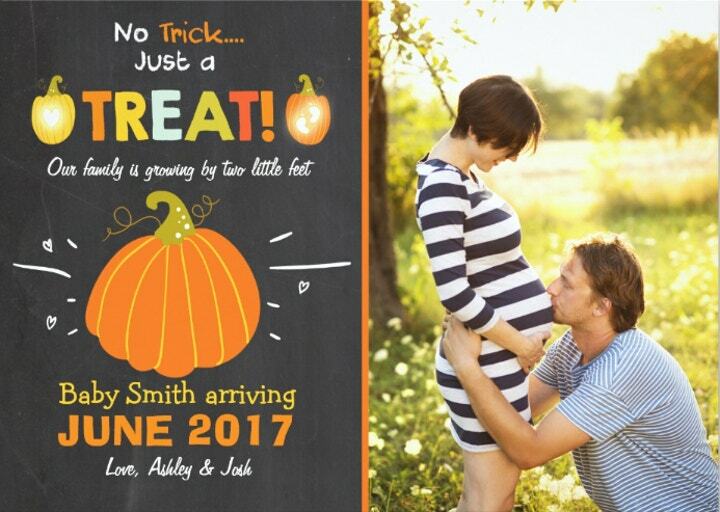 Take, for example, this Halloween pregnancy announcement card template. The event speaks for itself—a Halloween-inspired pregnancy announcement event. Pregnancy announcements are not celebrated as much as the child’s first birthday or a baby shower. Usually, expecting parents don’t hold parties just to announce their baby is on the way. This template uses cute images and colorful fonts to match the event with an image of a pumpkin incorporated at the center of the template. The pumpkin’s orange color is used throughout the template and a chalkboard design is used as the background. You can also add a picture of the expectant parents as seen in the template above. This template has a 5″ x 7″ portrait size and a 7″ x 5″ landscape size. This template also contains 12 unique paper types and colors with an additional 12 sizes and shape styles if you use the “Customize it!” button. Two printing options are available: standard and high definition. White envelopes are also included in this template. Do you want your website to have a Halloween theme? Use this WordPress theme that uses numerous Halloween effects and colors to make your website in tune with the Halloween season. This theme is best used for online shops where numerous Halloween-related items are sold and discounts are offered on numerous items, but you can use it for your website as well. This theme is equipped with a drag-and-drop Elementor Page Builder with a number of visual modules and elements which will aid you perfectly even if you’re not an experienced coder or programmer. Live Customizer will also let you manage color schemes, change a background, and typography design. If you want a more mature and terrifying Halloween template, here is the one for you. Compared to the other templates which focus on more child-friendly and colorful designs, this Halloween party template does the exact opposite and uses devious-looking 3D pumpkins with bat wings as the template’s main design. A silhouette of a witch flying across the bright moon accompanied by a colony of bats provides the background design of this party flyer template. The design of this template will make your guests horrified and excited at the same time. Text, objects and other elements found in this template can be easily changed and edited. The design has an 8.5″ x 11″ print-ready PSD file, 300 dpi or CMYK color, and a help file. Since Halloween is associated with ghouls, monsters, ghosts, and aliens, for the most part, it doesn’t mean that you have to look for terrifying images and incorporate them in all of your Halloween designs. Depending on the event, some designs need to be more formal compared to others. For example, if the hosts are holding their wedding ceremony during the Halloween season, then the last design they want to have their invitations are bloodstain effects or an image of a ghost with red eyes. Casual events don’t need to follow strict design procedures. There is no limit on the creativity for casual event designs as long as the final look is beautiful and can easily attract attention. Avoid designs in which little to no images can be found. Halloween, similar to Christmas templates, have numerous images associated with it. Use the images to your advantage to make the design more alluring and presentable. The pumpkin is not the only image associated with Halloween. Any object or creature that scares most people can be used in any Halloween design. Similar to the templates above, bats, spiders, witches, and monsters are all available for your use as long as you purchase them first. 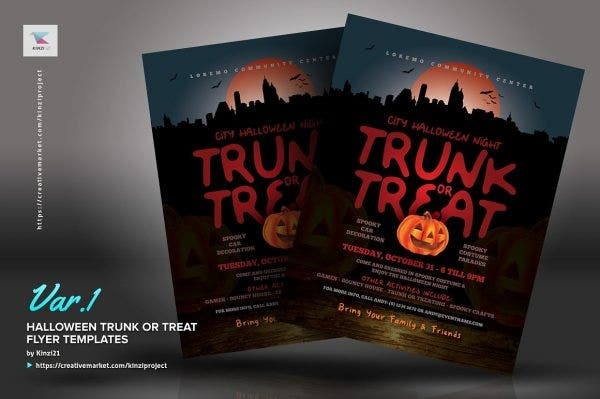 Having two designs for your event may be expensive as you will be printing out two designs. There is also a possibility not all of the designs will be distributed to the guests. Despite this, having an alternative or backup design will add to guests’ excitement. Especially during Halloween where hundreds of concepts can be used, it is hard to limit yourself to only one design and have the risk of over-stuffing the design with images and text. 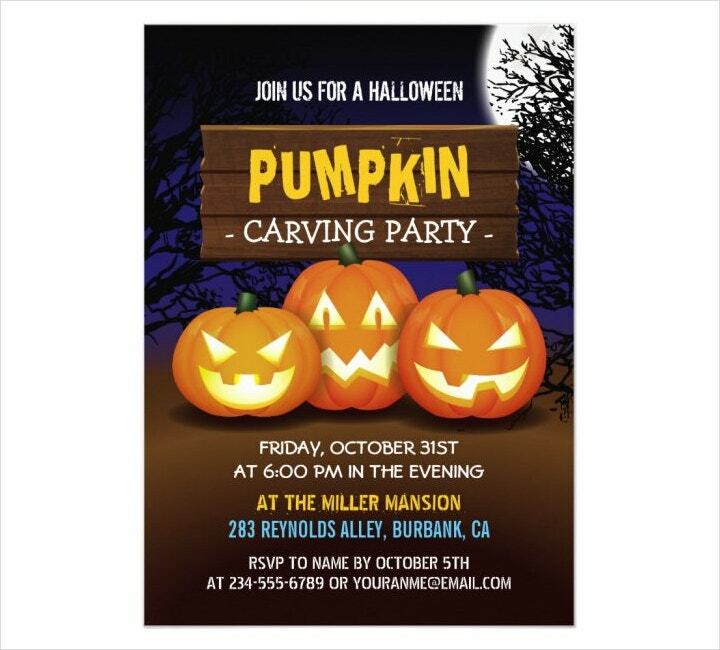 For example, if you are making a party invitation, you can use an image of an angry-faced pumpkin for one invitation and an image of a jolly-faced pumpkin in another invitation for the same event. If you are in a hurry and want those designs to be shared with the public as soon as possible, then purchase digital designs. They are very convenient, and most graphic designers do all of the editings before they send you the final product. Extra fees such as shipping costs are avoided since the designs can be sent via email. Also, digital designs can be accomplished within the day depending on how fast the designer works and how detailed you want your design to be. This is highly recommended if you are pressed for time or you want constant communication with the designer especially if there are errors with the design. The best designs are accomplished by the best designers. Before you decide to purchase order online, check the designer’s profile and take a hard look at his collection and customer reviews. The more positive the reactions and the more consistent his designs are, the better the chances you will have of getting your money’s worth and receive a very attractive design. So there you go, a variety of Halloween pumpkin templates you can use for any event. Purchase them now since Halloween is only a few days away.